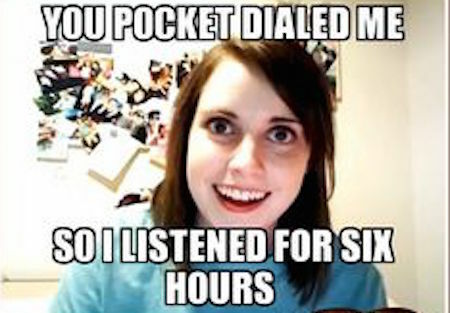 7 Signs Your Girlfriend Might Be Psycho. 1. 5 times a day you used to receive 143 texts (I LOVE YOU). Now, after an argument, you receive 15 of the 187 texts (POLICE CODE FOR HOMICIDE). 2. You have to turn your phone off when you are sleeping because you wake up in the morning to 57 text messages from the middle of the night IN ALL CAPS, when normal people are sleeping. 3. She tells you what you and her have is “really special” before you even go on your first date. 5. She tells your NEW girlfriend, the one you met 6 months after you broke up with the psycho, that she’s a home wrecker. 6. She has her pregnant friend pee on the pregnancy test stick and tells you she’s pregnant so you stick around a little longer. 7. She doesn’t understand that fights are supposed to be in private, as she smashes your phone in the checkout line at Walmart. Men, It’s best to start looking for these signs early in the relationship so you are not blindsided later on with a butcher knife or the bumper of a car. If your girlfriend is really a psycho, you should see at least one of these signs within the first month. If so, RUN! It’s not worth the drama.